Definition at line 61 of file QweakSimShieldingWall.hh. Definition at line 46 of file QweakSimShieldingWall.cc. References BackWall_CenterZPosition, BackWall_FullLength_X, BackWall_FullLength_Y, BackWall_FullLength_Z, BackWall_Logical, BackWall_Material, BackWall_Physical, BackWall_VisAtt, BackWallBeamCutout_FullLength_X, BackWallBeamCutout_FullLength_Y, BackWallBeamCutout_FullLength_Z, BeamLeftSideWall_CenterXPosition, BeamLeftSideWall_CenterZPosition, BeamLeftSideWall_FullLength_X, BeamLeftSideWall_FullLength_Y, BeamLeftSideWall_FullLength_Z, BeamLeftSideWall_Logical, BeamLeftSideWall_Material, BeamLeftSideWall_Physical, BeamLeftSideWall_VisAtt, BeamRightSideWall_CenterXPosition, BeamRightSideWall_CenterZPosition, BeamRightSideWall_FullLength_X, BeamRightSideWall_FullLength_Y, BeamRightSideWall_FullLength_Z, BeamRightSideWall_Logical, BeamRightSideWall_Material, BeamRightSideWall_Physical, BeamRightSideWall_VisAtt, DeltaZOffset_FrontWall_ShieldingWall, FrontWall_CenterZPosition, FrontWall_FullLength_X, FrontWall_FullLength_Y, FrontWall_FullLength_Z, FrontWall_Logical, FrontWall_Material, FrontWall_Physical, FrontWall_UpStreamWall_ZPosition, FrontWall_VisAtt, FrontWallBeamCutout_FullLength_X, FrontWallBeamCutout_FullLength_Y, FrontWallBeamCutout_FullLength_Z, QweakSimMaterial::GetInstance(), QweakSimMaterial::GetMaterial(), inch, InnerHut_FullLength_X, InnerHut_FullLength_Z, MyBackWall_Solid, MyFrontWall_Solid, MyShieldingWallHousing_Solid, OctantCutOut_Trap_AzimuthalAngle, OctantCutOut_Trap_FullHeightBack, OctantCutOut_Trap_FullHeightFront, OctantCutOut_Trap_FullLengthBack_Inner, OctantCutOut_Trap_FullLengthBack_Outer, OctantCutOut_Trap_FullLengthFront_Inner, OctantCutOut_Trap_FullLengthFront_Outer, OctantCutOut_Trap_PolarAngle, OctantCutOut_Trap_RadialDistance, pMaterial, ShieldingWallHousing_CenterZPosition, ShieldingWallHousing_FullLength_X, ShieldingWallHousing_FullLength_Y, ShieldingWallHousing_FullLength_Z, ShieldingWallHousing_Logical, ShieldingWallHousing_Material, ShieldingWallHousing_Physical, ShieldingWallHousing_UpStreamWall_ZPosition, ShieldingWallHousing_VisAtt, ShieldingWallMessenger, TopWall_CenterYPosition, TopWall_CenterZPosition, TopWall_FullLength_X, TopWall_FullLength_Y, TopWall_FullLength_Z, TopWall_Logical, TopWall_Material, TopWall_Physical, and TopWall_VisAtt. 68 // Update the z location. - Peiqing 2011 Nov. Definition at line 256 of file QweakSimShieldingWall.cc. Definition at line 976 of file QweakSimShieldingWall.cc. References BackWall_CenterZPosition, BackWall_FullLength_X, BackWall_FullLength_Y, BackWall_FullLength_Z, BackWall_Logical, BackWall_Material, BackWall_Physical, BackWall_VisAtt, BackWallBeamCutout_FullLength_X, BackWallBeamCutout_FullLength_Y, BackWallBeamCutout_FullLength_Z, MyBackWall_Solid, positionBackWall, and pSurfChk. Definition at line 1039 of file QweakSimShieldingWall.cc. References BeamLeftSideWall_CenterXPosition, BeamLeftSideWall_CenterZPosition, BeamLeftSideWall_FullLength_X, BeamLeftSideWall_FullLength_Y, BeamLeftSideWall_FullLength_Z, BeamLeftSideWall_Logical, BeamLeftSideWall_Material, BeamLeftSideWall_Physical, BeamLeftSideWall_VisAtt, positionBeamLeftSideWall, and pSurfChk. Definition at line 1088 of file QweakSimShieldingWall.cc. References BeamRightSideWall_CenterXPosition, BeamRightSideWall_CenterZPosition, BeamRightSideWall_FullLength_X, BeamRightSideWall_FullLength_Y, BeamRightSideWall_FullLength_Z, BeamRightSideWall_Logical, BeamRightSideWall_Material, BeamRightSideWall_Physical, BeamRightSideWall_VisAtt, positionBeamRightSideWall, and pSurfChk. Definition at line 912 of file QweakSimShieldingWall.cc. References FrontWall_CenterZPosition, FrontWall_FullLength_X, FrontWall_FullLength_Y, FrontWall_FullLength_Z, FrontWall_Logical, FrontWall_Material, FrontWall_Physical, FrontWall_VisAtt, FrontWallBeamCutout_FullLength_X, FrontWallBeamCutout_FullLength_Y, FrontWallBeamCutout_FullLength_Z, MyFrontWall_Solid, positionFrontWall, and pSurfChk. Definition at line 670 of file QweakSimShieldingWall.cc. References DefineOctantCutOut_UsingACone(), MyShieldingWallHousing_Solid, OctantCutOut_Cone_Solid, positionShieldingWallHousing, pSurfChk, ShieldingWallHousing_CenterZPosition, ShieldingWallHousing_FullLength_X, ShieldingWallHousing_FullLength_Y, ShieldingWallHousing_FullLength_Z, ShieldingWallHousing_Logical, ShieldingWallHousing_Material, ShieldingWallHousing_Physical, and ShieldingWallHousing_VisAtt. Definition at line 315 of file QweakSimShieldingWall.cc. References DefineOctantCutOut_UsingATrapezoid(), MyShieldingWallHousing_Solid, OctantCutOut_Trap_RadialDistance, OctantCutOut_Trap_Solid, positionShieldingWallHousing, pSurfChk, ShieldingWallHousing_CenterZPosition, ShieldingWallHousing_FullLength_X, ShieldingWallHousing_FullLength_Y, ShieldingWallHousing_FullLength_Z, ShieldingWallHousing_Logical, ShieldingWallHousing_Material, ShieldingWallHousing_Physical, and ShieldingWallHousing_VisAtt. Definition at line 1136 of file QweakSimShieldingWall.cc. References positionTopWall, pSurfChk, TopWall_CenterYPosition, TopWall_CenterZPosition, TopWall_FullLength_X, TopWall_FullLength_Y, TopWall_FullLength_Z, TopWall_Logical, TopWall_Material, TopWall_Physical, and TopWall_VisAtt. Definition at line 295 of file QweakSimShieldingWall.cc. References OctantCutOut_Cone_BackInnerDiameter, OctantCutOut_Cone_BackOuterDiameter, OctantCutOut_Cone_DeltaPhiAngle, OctantCutOut_Cone_FrontInnerDiameter, OctantCutOut_Cone_FrontOuterDiameter, OctantCutOut_Cone_Solid, OctantCutOut_Cone_StartingPhiAngle, and ShieldingWallHousing_FullLength_Z. Definition at line 262 of file QweakSimShieldingWall.cc. References OctantCutOut_Trap_AzimuthalAngle, OctantCutOut_Trap_FullHeightBack, OctantCutOut_Trap_FullHeightFront, OctantCutOut_Trap_FullLengthBack_Inner, OctantCutOut_Trap_FullLengthBack_Outer, OctantCutOut_Trap_FullLengthFront_Inner, OctantCutOut_Trap_FullLengthFront_Outer, OctantCutOut_Trap_PolarAngle, OctantCutOut_Trap_Solid, and ShieldingWallHousing_FullLength_Z. Definition at line 576 of file QweakSimShieldingWall.cc. Definition at line 100 of file QweakSimShieldingWall.hh. Definition at line 101 of file QweakSimShieldingWall.hh. Definition at line 1236 of file QweakSimShieldingWall.cc. Definition at line 1255 of file QweakSimShieldingWall.cc. Definition at line 1275 of file QweakSimShieldingWall.cc. Definition at line 1195 of file QweakSimShieldingWall.cc. Definition at line 1216 of file QweakSimShieldingWall.cc. Definition at line 1294 of file QweakSimShieldingWall.cc. Definition at line 582 of file QweakSimShieldingWall.cc. Referenced by QweakSimDetectorConstruction::ConstructQweak(), and QweakSimShieldingWallMessenger::SetNewValue(). Definition at line 651 of file QweakSimShieldingWall.cc. Definition at line 657 of file QweakSimShieldingWall.cc. Definition at line 663 of file QweakSimShieldingWall.cc. Definition at line 558 of file QweakSimShieldingWall.cc. Definition at line 91 of file QweakSimShieldingWall.hh. Definition at line 92 of file QweakSimShieldingWall.hh. Definition at line 94 of file QweakSimShieldingWall.hh. Definition at line 89 of file QweakSimShieldingWall.hh. Definition at line 90 of file QweakSimShieldingWall.hh. Definition at line 93 of file QweakSimShieldingWall.hh. Definition at line 644 of file QweakSimShieldingWall.cc. Definition at line 631 of file QweakSimShieldingWall.cc. Definition at line 625 of file QweakSimShieldingWall.cc. Definition at line 618 of file QweakSimShieldingWall.cc. Definition at line 611 of file QweakSimShieldingWall.cc. Definition at line 604 of file QweakSimShieldingWall.cc. Definition at line 597 of file QweakSimShieldingWall.cc. Definition at line 637 of file QweakSimShieldingWall.cc. Definition at line 591 of file QweakSimShieldingWall.cc. Definition at line 1227 of file QweakSimShieldingWall.cc. Definition at line 1246 of file QweakSimShieldingWall.cc. Definition at line 1266 of file QweakSimShieldingWall.cc. Definition at line 1186 of file QweakSimShieldingWall.cc. Definition at line 1207 of file QweakSimShieldingWall.cc. Definition at line 1285 of file QweakSimShieldingWall.cc. Definition at line 228 of file QweakSimShieldingWall.hh. Referenced by ConstructBackWall(), and QweakSimShieldingWall(). Definition at line 216 of file QweakSimShieldingWall.hh. Definition at line 217 of file QweakSimShieldingWall.hh. Definition at line 218 of file QweakSimShieldingWall.hh. Definition at line 212 of file QweakSimShieldingWall.hh. Definition at line 214 of file QweakSimShieldingWall.hh. Definition at line 213 of file QweakSimShieldingWall.hh. Definition at line 227 of file QweakSimShieldingWall.hh. Definition at line 231 of file QweakSimShieldingWall.hh. Referenced by ConstructBackWall(), HideBackWall(), QweakSimShieldingWall(), and ShowBackWall(). Definition at line 220 of file QweakSimShieldingWall.hh. Definition at line 221 of file QweakSimShieldingWall.hh. Definition at line 222 of file QweakSimShieldingWall.hh. Definition at line 244 of file QweakSimShieldingWall.hh. Referenced by ConstructBeamLeftSideWall(), and QweakSimShieldingWall(). Definition at line 245 of file QweakSimShieldingWall.hh. Definition at line 240 of file QweakSimShieldingWall.hh. Definition at line 241 of file QweakSimShieldingWall.hh. Definition at line 242 of file QweakSimShieldingWall.hh. Definition at line 236 of file QweakSimShieldingWall.hh. Definition at line 238 of file QweakSimShieldingWall.hh. Definition at line 237 of file QweakSimShieldingWall.hh. Definition at line 248 of file QweakSimShieldingWall.hh. Referenced by ConstructBeamLeftSideWall(), HideBeamLeftSideWall(), QweakSimShieldingWall(), and ShowBeamLeftSideWall(). Definition at line 265 of file QweakSimShieldingWall.hh. Referenced by ConstructBeamRightSideWall(), and QweakSimShieldingWall(). Definition at line 266 of file QweakSimShieldingWall.hh. Definition at line 257 of file QweakSimShieldingWall.hh. Definition at line 258 of file QweakSimShieldingWall.hh. Definition at line 259 of file QweakSimShieldingWall.hh. Definition at line 253 of file QweakSimShieldingWall.hh. Definition at line 255 of file QweakSimShieldingWall.hh. Definition at line 254 of file QweakSimShieldingWall.hh. Definition at line 269 of file QweakSimShieldingWall.hh. Referenced by ConstructBeamRightSideWall(), HideBeamRightSideWall(), QweakSimShieldingWall(), and ShowBeamRightSideWall(). Definition at line 261 of file QweakSimShieldingWall.hh. Definition at line 262 of file QweakSimShieldingWall.hh. Definition at line 263 of file QweakSimShieldingWall.hh. Definition at line 226 of file QweakSimShieldingWall.hh. Definition at line 202 of file QweakSimShieldingWall.hh. Definition at line 204 of file QweakSimShieldingWall.hh. Referenced by ConstructFrontWall(), and QweakSimShieldingWall(). Definition at line 192 of file QweakSimShieldingWall.hh. Definition at line 193 of file QweakSimShieldingWall.hh. Definition at line 194 of file QweakSimShieldingWall.hh. Definition at line 188 of file QweakSimShieldingWall.hh. Definition at line 190 of file QweakSimShieldingWall.hh. Definition at line 189 of file QweakSimShieldingWall.hh. Definition at line 203 of file QweakSimShieldingWall.hh. Definition at line 207 of file QweakSimShieldingWall.hh. Referenced by ConstructFrontWall(), HideFrontWall(), QweakSimShieldingWall(), and ShowFrontWall(). Definition at line 196 of file QweakSimShieldingWall.hh. Definition at line 197 of file QweakSimShieldingWall.hh. Definition at line 198 of file QweakSimShieldingWall.hh. Definition at line 182 of file QweakSimShieldingWall.hh. Definition at line 183 of file QweakSimShieldingWall.hh. Definition at line 224 of file QweakSimShieldingWall.hh. Definition at line 200 of file QweakSimShieldingWall.hh. Definition at line 167 of file QweakSimShieldingWall.hh. 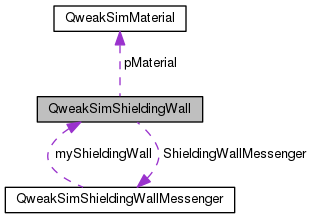 Referenced by ConstructShieldingWallHousing_UsingCones(), ConstructShieldingWallHousing_UsingTrapezoids(), and QweakSimShieldingWall(). Definition at line 161 of file QweakSimShieldingWall.hh. Referenced by DefineOctantCutOut_UsingACone(), and SetOctantCutOut_Cone_BackInnerDiameter(). Definition at line 162 of file QweakSimShieldingWall.hh. Referenced by DefineOctantCutOut_UsingACone(), and SetOctantCutOut_Cone_BackOuterDiameter(). Definition at line 164 of file QweakSimShieldingWall.hh. Referenced by DefineOctantCutOut_UsingACone(), and SetOctantCutOut_Cone_DeltaPhiAngle(). Definition at line 159 of file QweakSimShieldingWall.hh. Referenced by DefineOctantCutOut_UsingACone(), and SetOctantCutOut_Cone_FrontInnerDiameter(). Definition at line 160 of file QweakSimShieldingWall.hh. Referenced by DefineOctantCutOut_UsingACone(), and SetOctantCutOut_Cone_FrontOuterDiameter(). Definition at line 174 of file QweakSimShieldingWall.hh. Referenced by ConstructShieldingWallHousing_UsingCones(), and DefineOctantCutOut_UsingACone(). Definition at line 163 of file QweakSimShieldingWall.hh. Referenced by DefineOctantCutOut_UsingACone(), and SetOctantCutOut_Cone_StartingPhiAngle(). Definition at line 149 of file QweakSimShieldingWall.hh. Referenced by DefineOctantCutOut_UsingATrapezoid(), QweakSimShieldingWall(), and SetOctantCutOut_Trap_AzimuthalAngle(). Definition at line 155 of file QweakSimShieldingWall.hh. Referenced by DefineOctantCutOut_UsingATrapezoid(), QweakSimShieldingWall(), and SetOctantCutOut_Trap_FullHeightBack(). Definition at line 151 of file QweakSimShieldingWall.hh. Referenced by DefineOctantCutOut_UsingATrapezoid(), QweakSimShieldingWall(), and SetOctantCutOut_Trap_FullHeightFront(). Definition at line 157 of file QweakSimShieldingWall.hh. Referenced by DefineOctantCutOut_UsingATrapezoid(), QweakSimShieldingWall(), and SetOctantCutOut_Trap_FullLengthBack_Inner(). Definition at line 156 of file QweakSimShieldingWall.hh. Referenced by DefineOctantCutOut_UsingATrapezoid(), QweakSimShieldingWall(), and SetOctantCutOut_Trap_FullLengthBack_Outer(). Definition at line 153 of file QweakSimShieldingWall.hh. Referenced by DefineOctantCutOut_UsingATrapezoid(), QweakSimShieldingWall(), and SetOctantCutOut_Trap_FullLengthFront_Inner(). Definition at line 152 of file QweakSimShieldingWall.hh. Referenced by DefineOctantCutOut_UsingATrapezoid(), QweakSimShieldingWall(), and SetOctantCutOut_Trap_FullLengthFront_Outer(). Definition at line 148 of file QweakSimShieldingWall.hh. Referenced by DefineOctantCutOut_UsingATrapezoid(), QweakSimShieldingWall(), and SetOctantCutOut_Trap_PolarAngle(). Definition at line 147 of file QweakSimShieldingWall.hh. Referenced by ConstructShieldingWallHousing_UsingTrapezoids(), QweakSimShieldingWall(), and SetOctantCutOut_Trap_RadialDistance(). Definition at line 173 of file QweakSimShieldingWall.hh. Referenced by ConstructShieldingWallHousing_UsingTrapezoids(), and DefineOctantCutOut_UsingATrapezoid(). Definition at line 134 of file QweakSimShieldingWall.hh. Definition at line 230 of file QweakSimShieldingWall.hh. Definition at line 247 of file QweakSimShieldingWall.hh. Definition at line 268 of file QweakSimShieldingWall.hh. Definition at line 206 of file QweakSimShieldingWall.hh. Definition at line 176 of file QweakSimShieldingWall.hh. Referenced by ConstructShieldingWallHousing_UsingCones(), and ConstructShieldingWallHousing_UsingTrapezoids(). Definition at line 286 of file QweakSimShieldingWall.hh. Definition at line 145 of file QweakSimShieldingWall.hh. Definition at line 140 of file QweakSimShieldingWall.hh. Referenced by ConstructShieldingWallHousing_UsingCones(), ConstructShieldingWallHousing_UsingTrapezoids(), QweakSimShieldingWall(), and SetCollimatorWall_FullLengthInX(). Definition at line 141 of file QweakSimShieldingWall.hh. Referenced by ConstructShieldingWallHousing_UsingCones(), ConstructShieldingWallHousing_UsingTrapezoids(), QweakSimShieldingWall(), and SetCollimatorWall_FullLengthInY(). Definition at line 142 of file QweakSimShieldingWall.hh. Referenced by ConstructShieldingWallHousing_UsingCones(), ConstructShieldingWallHousing_UsingTrapezoids(), DefineOctantCutOut_UsingACone(), DefineOctantCutOut_UsingATrapezoid(), QweakSimShieldingWall(), and SetCollimatorWall_FullLengthInZ(). Definition at line 136 of file QweakSimShieldingWall.hh. Referenced by ConstructShieldingWallHousing_UsingCones(), ConstructShieldingWallHousing_UsingTrapezoids(), getShieldingWallHousingLogicalVolume(), QweakSimShieldingWall(), and SetCollimatorWallMaterial(). Definition at line 138 of file QweakSimShieldingWall.hh. Definition at line 137 of file QweakSimShieldingWall.hh. Referenced by ConstructShieldingWallHousing_UsingCones(), ConstructShieldingWallHousing_UsingTrapezoids(), getShieldingWallHousingPhysicalVolume(), QweakSimShieldingWall(), and SetCollimatorWall_CenterPositionInZ(). Definition at line 144 of file QweakSimShieldingWall.hh. Definition at line 177 of file QweakSimShieldingWall.hh. Referenced by ConstructShieldingWallHousing_UsingCones(), ConstructShieldingWallHousing_UsingTrapezoids(), HideCollimatorWall(), QweakSimShieldingWall(), and ShowCollimatorWall(). Definition at line 132 of file QweakSimShieldingWall.hh. Referenced by QweakSimShieldingWall(), and ~QweakSimShieldingWall(). Definition at line 283 of file QweakSimShieldingWall.hh. Referenced by ConstructTopWall(), and QweakSimShieldingWall(). Definition at line 284 of file QweakSimShieldingWall.hh. Definition at line 279 of file QweakSimShieldingWall.hh. Definition at line 280 of file QweakSimShieldingWall.hh. Definition at line 281 of file QweakSimShieldingWall.hh. Definition at line 275 of file QweakSimShieldingWall.hh. Definition at line 277 of file QweakSimShieldingWall.hh. Definition at line 276 of file QweakSimShieldingWall.hh. Definition at line 287 of file QweakSimShieldingWall.hh. Referenced by ConstructTopWall(), HideTopWall(), QweakSimShieldingWall(), and ShowTopWall().